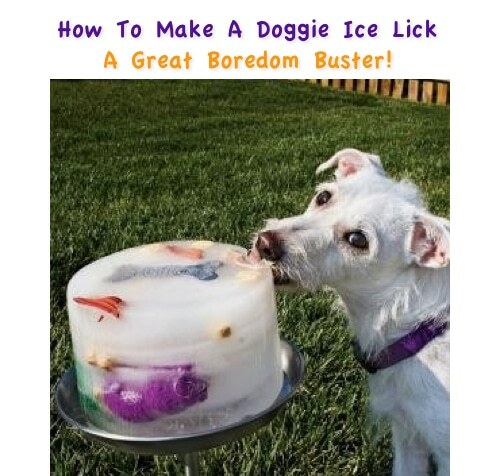 Keep your dog cool and entertained in the hot summer months with this easy to make ice doggie lick. Fill a large container (such as a bucket) with a mixture of water and chicken stock and add some of your dogs favorite toys. Freeze the mixture (it can take up to a day depending on the size) and once frozen solid, upend the container and place on a stand. Your dog will lick away at the tasty chicken stock and water mixture keeping them cool and entertained! What a fun idea! We found this idea via Cold Nose Mag. It originally was posted on Fetch Dog but the site has now disappeared. Like this idea? Share it on Facebook and Pinterest using the buttons above.